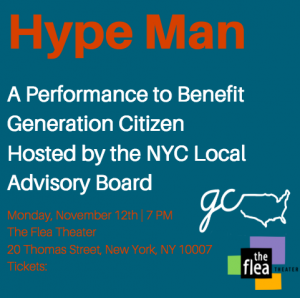 The Generation Citizen New York City’s Local Advisory Board is excited to invite you to a private evening of theater to benefit Generation Citizen at The Flea Theater on Monday, November 12th for the 7pm performance of Hype Man, followed by a wine reception and talk back with the cast. The play by Idris Goodwin follows a front man, hype man and beat maker on the verge of hitting it big when yet another police shooting shakes them to the core. Following its sold out run in Boston, this hip hop play dares to ask who has the responsibility to speak up in the face of social injustice. Hype Man confronts head on the very issue that the majority of GC students nationwide seek to address through their in class action projects – how to improve community-police relations. Generation Citizen is a national nonprofit dedicated to reinvigorating civics education in schools through a new and exciting approach: Action Civics. GC partners with middle and high schools in New York City, as well as in 5 other regions nationwide, to educate and empower students about how to effect systemic change on an issue directly impacting them by engaging directly with government to solve a local problem. For the last several years, the most pressing issue GC students nationwide seek to address in their Action Civics class is police brutality. Tickets for Hype Man are *$150, which will support Generation Citizen New York City in providing an Action Civics education to New York City public school students. Please click on this link to our website to purchase your ticket(s) and please include “Hype Man” in the special instructions to the seller field. If you are unable to attend Hype Man, please consider making a donation to Generation Citizen. *Generation Citizen is a 501(c)3 tax-exempt public charity. The tax-deductible portion of your donation is $120.